In Icelandic crime writer Arnaldur Indridason’s “Arctic Chill” the story once again centres on senior detective Erlendur Sveinson and his team. Having now read several of the series, the characters were familiar to me and by now I would say that it would be better to read one of the earlier books rather than start with this one. This time Erlendur has to investigate the death of a young boy, a child whose mother is a Thai immigrant, now separated from the boy’s father, an Icelander. The boy is found in the snow near his home having died from a stab wound. When the detectives go to inform the mother, they learn that the boy’s older brother has failed to return home from school and, curiously, she seems more worried about the older boy’s disappearance than about the loss of her younger child. Hardly has the older boy been found when his mother manages to have him taken, without the police realising, to some hiding place. Initial questioning reveals strong inter-racial tensions in the boys’ school and not just among the pupils. Just when it looks like a motive may be emerging, one of the standard checks on local prolific offenders, a standard procedure in investigations of this type of crime, throws up some potentially useful information. Whereas I felt that the previous books in this series felt anchored in their setting, “Arctic Chill” is quite different. This is a story that could have taken place in any European country: it doesn’t reveal anything new or surprising about how Icelanders feel about immigrants, especially at a time of financial crisis in that country. The previous books have at their core some topic that is intrinsically Iceland, perhaps based on a cultural or historical detail that roots the story firmly in Iceland and no other place. Although Indridason does his usual fine job of depicting Iceland and, this time, what it is to live there during the long harsh winters, there was little of the essence that sets his books apart from those of other Scandinavian crime fiction writers. Having now become acquainted with the key characters of Erlendur and the junior detectives Elinborg and Sigurdur Oli, I did enjoyed learning a bit more about them but as usual this was deliberately limited, no doubt to reflect the somewhat distant relationships Icelanders have with even those people they work closely with on a daily basis. It is interesting to see that while the immigrants have tight knit and supportive communities, it is the Icelanders who keep each other at arm’s length. Nowhere is this more apparent than in the death of Marion, Erlendur’s former superior officer. It has been an ongoing feature of the books that the reader never learns Marion’s gender (the name can be given to either gender in Iceland) and even in Marion’ s final hours and the touching death scene when Erlendur reads to Marion, the reader is still kept in the dark. Another interesting aspect of this novel was the continuation of a thread which has been present since the first book. When they were children, Erlendur and his brother were caught in a snowstorm and while Erlendur managed to bury himself in some snow and survive, his brother was never found and presumed dead. During the course of “Arctic Chill” Erlendur’s daughter, Jenny Lind, tells her father that she has heard rumours about the event and she wants to know the truth. For Erlendur, who has never talked to his family about what happened that night, her questions open up some painful wounds. While these aspects of “Arctic Chill” show that Indridason is capable of some fine writing, it shouldn’t be forgotten that this is supposed to be crime fiction and, on this occasion, he fails to make the grade. The murder story is weak and unoriginal and the ending comes frustratingly from nowhere denying readers a chance to try to solve the mystery themselves. The immigration storyline becomes more journalistic than fictional and feels like it was written with the deliberate aim of making a point about Icelandic life. 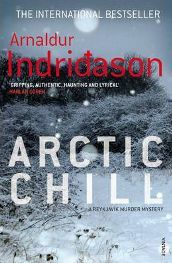 Indridason is a great writer and the characterisation, in particular, remains as excellent as ever; however, I would suggest that “Arctic Chill” is not a good place to start for newcomers to his novels. I was pleased to have read this instalment but only to keep up with the developments in the personal lives of the central characters. Recommended only for readers who have read the previous novels and wish to keep up. The previous novels, however, are highly recommended. One Comment on "Arctic Chill"